Pastiche, parody, homage and self-indulgence are all easy countries to visit but difficult countries to leave. Done wrong, what plays to you as a witty, elegant celebration of a story type you happen to like can seem like an endless waltz to someone else’s music. Where you see knowing, affectionate nods they see smug jokes they don’t get. Where you see gentle parody of elements that are difficult to accept, they see a stolid, conservative celebration of irrelevancy. It’s tough, and many authors have tried and failed to do it successfully. Brian Keene isn’t one of them. The Lost Level wobbles in its opening chapters but as the book goes on it becomes clear that Keene has not only been here before but, unlike his lead, he knows the way out. The Lost Level follows Aaron Pace, a modern day occultist who successfully discovers how to travel between dimensions. Careful to not be carried away by his new gift, Aaron is always cautious to make sure he has a way out. He’s physically fit, well-educated and thinks he has it all covered. There’s a level of the multiverse, nicknamed the Labyrinth by Aaron, where the doors only open one way. Once you’re in, you can’t leave and when Aaron finds himself there, he realizes he’s very far from the only person to make the one way trip. The Lost Level is the last place anyone goes and as Aaron finds out, its inhabitants are as dangerous as they are diverse. That’s a lovely, pulpy premise and for the first few chapters you worry that’s all you’re going to get. Keene does a great job of both establishing Aaron’s competency and accepting that he’s insanely lucky to be this well prepared but, as the novel goes on, and Aaron gains a bestial sidekick and a beautiful, not especially clothed, partner and lover, you start to feel a little concerned. Pulp is all well and good but the danger of tipping over from an affectionate nod to slavish devotion is very apparent in those early chapters. Then you realize just how clever Keene is. 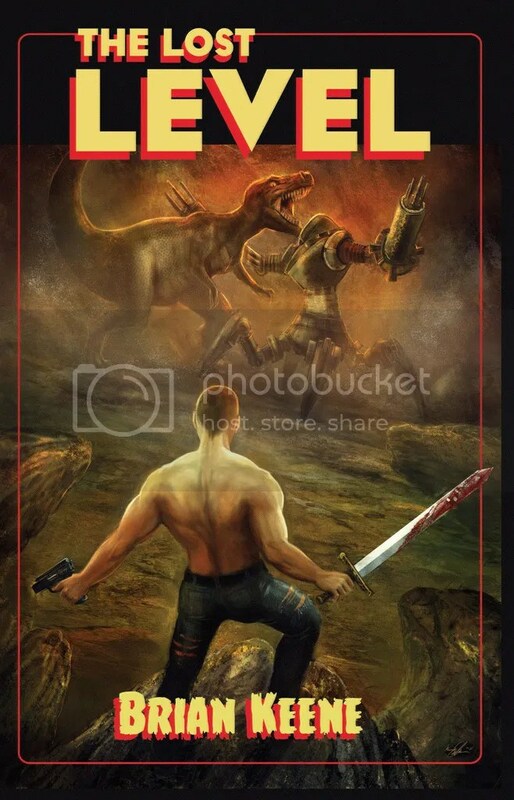 Yes, this is a pulp novel and one that features a scantily clad female pseudo-barbarian, evil lizard people and a deliriously unsettling fight between a dinosaur and a mecha. But for all the clear glee that Keene takes playing with these vintage toys, he always does so with a modern sensibility. Aaron is just this side of plausibly competent, certainly, but he’s also human. He misses home, continually kicks himself for not seeing the one way door into the Lost Level and is refreshingly fallible. Even the framing narrative, of an older Aaron scribbling his life story down in what may be his final moments, reinforces that. This is a man better equipped than most to survive in a place like The Lost Level and he’s only just managing to. That, combined with Keene’s strong visual sense gives the entire book a welcome dose of reality. This is a ludicrous, but intensely dangerous, place and we’re never allowed to forget that. Aaron’s encounter with a dying cowboy is especially poignant, as is the joy he feels at finding hints of human life in a jeep embedded in a cliff side. Home remains tantalizingly close but impossible to reach, despite Aaron’s best efforts. Keene refuses to pull any punches throughout the novel and the closing sequence is an especially unsettling look at one of the species that’s made the Level its home. This is pulp as it has to be in a modern arena; both delightfully ludicrous and intensely dangerous. Aaron is far less of a superman than he initially seems and Keene has far more dangerous plans for him than the first couple of chapters suggest. As a result, this is a tightly plotted, inventive and dangerous piece of pulp fiction of the very highest quality. Not just a celebration of its inspirations but also an inventive, intelligent and necessary updating of them. The Lost Level is available here.